Alex Noppe’s lyrical trumpet playing is prominent throughout this contemplative jazz disc from composer-percussionist Louis Romanos and his quartet. Noppe’s buttery flugelhorn is heard to pleasing effect in the opening bars of Romanos’s Spiritual, which sounds like a tribute to Chuck Mangione’s Feels So Good. After an ostinato opening, a catchy, upbeat shuffle arrives, with Dan Sumner’s electric guitar joining Noppe on solos. Comprised entirely of Romanos’ originals, the album features more of Noppe’s fine trumpet and flugelhorn work, the latter on Lovely, a wandering ballad. 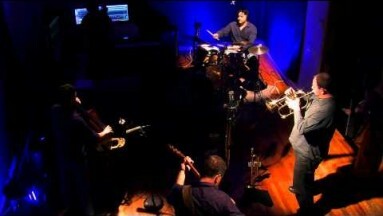 Romanos’s percussion supports everything nicely, augmented by tasty playing from veteran Atlanta bassist Neal Starkey. Reviews of our album, Take Me There, and of our 2015 tours (so far). Take a look . . .
With “Songo 7”, the first song of this album, you realize the tremendous talent Mr. Romanos and his band have for playing with heart and soul to create a profound sound full of elegance and virtuosity . . . This melodic venture was born in one of the great musical lands of the world, New Orleans, United States, by the percussionist and composer Louis Romanos. The project was the fruit of hope for this artist after leaving New Orleans due to the merciless hurricane Katrina, and settling in Athens, GA . . . Each song has a little bit of Latin jazz, modern sound, bebop style and New Orleans beat. Pure synergy is expressed in each player’s performance as they propose an honest dialog where musicianship is the sweet-sounding sap that flows into its lines. A perfect example is “Lovely”, maybe the most inspiring song of this work, with special and magical power that moves the profound heartstrings of listeners. This beautiful theme starts with some smooth guitar notes that sound like a harp, like the song of mermaids hypnotizing those who listen to it. There is a clear-cut ensemble identity of shared vision and the willingness to suppress ego and virtuosity for its own sake to deliver the message. Seamless interplay, knowing anticipation and total empathy abound. Solos are not simply supported, but punctuated, enhanced and further emphasized by the other musicians. In the classic tradition of the profound art form of jazz, the music tells stories and paints pictures, with Louis’ drumming providing the plot continuity and unifying the color pattern on each canvas. Every piece – from ballad to scorcher – builds in intensity to its appropriate climax without ever losing its focus on the thematic context. In order to help make Take Me There happen, the quartet ran an IndieGogo crowdfunding campaign in August of 2014. Response was overwhelming, and we’re so grateful for the outpouring of support for what we do. Thanks to our friends, the quartet will continue performing, recording, and teaching. We appreciate the kind words . . .